This month has absolutely flown by, but I can absolutely say that October has been the best month of the year to date and I’ve been loving and discovering a lot of new things, much to my surprise. It’s always nice when a favourites post actually feels like it’s going to be bulky and a good read instead of just 3 products pulled together out of thin air. First up is something I’m going to be speaking about a lot more in depth in my Reflection post, but I just felt like I had to mention it. When this post goes up, it will be the last day of Blogtober and this is my 31st post published this month. 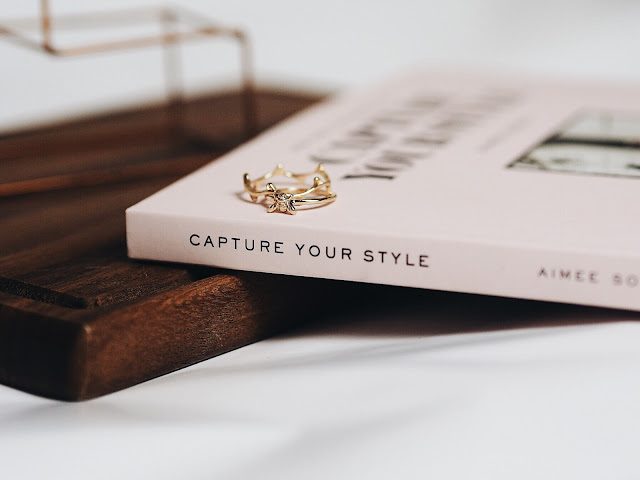 It has honestly made me fall in love with blogging more than ever before, which is not what I was expecting! I thought I would feel really run down and like I needed a break at the end of this, but the complete opposite has happened and I’m planning a lot more content in November, and I’ll of course be tackling Blogmas. I’ve loved creating all this content and I’ve loved the sudden creative spur I seem to be having. I’m really excited for November’s content; I have a lot of hard work ahead of me but I’m more than ready for it and seem to be managing my time pretty well at the minute (touch wood). My skin has been ridiculously up and down this month, some days I’ve been so happy with it and other days I’ve not wanted to leave the house because it’s so awful. A pretty standard month to be honest. 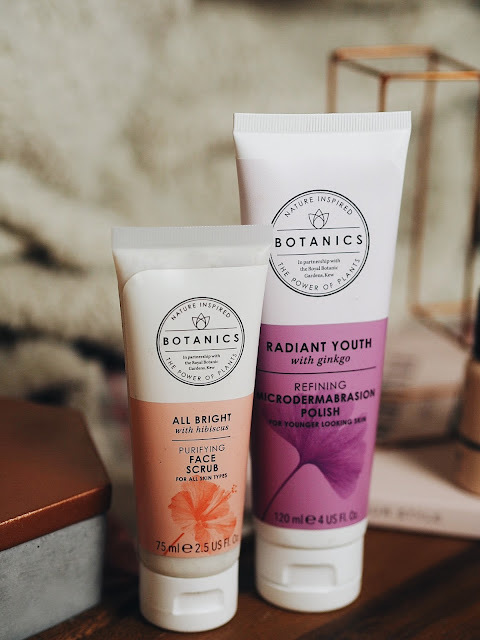 I’ve fallen out of a skincare routine a little bit and I find that I’m too exhausted when I get home to do anything fancy, so I’ve re-integrated some facial scrubs into my routine – I like them as a quick way of exfoliating. I use the Botanics All Bright Purifying Face Scrub every night when I shower, and then once or twice a week I use their Radiant Youth Microdermabrasion Polish. I spoke about microdermabrasion in THIS post, I just find using the polish a lot quicker than using the little brush, and my priority right now is getting enough sleep. 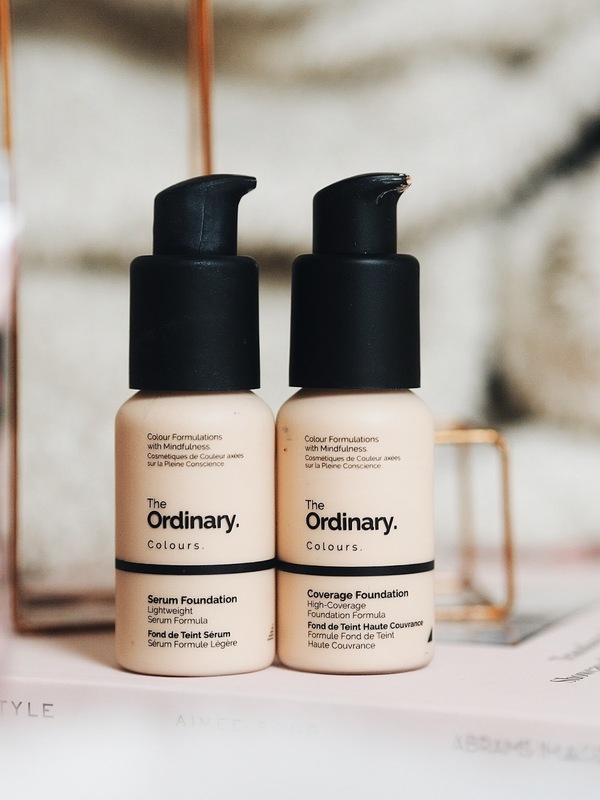 Both of these clear up my complexion completely and I love how they make my skin look when I get out the shower; they’re definitely helping to clear up my spots. 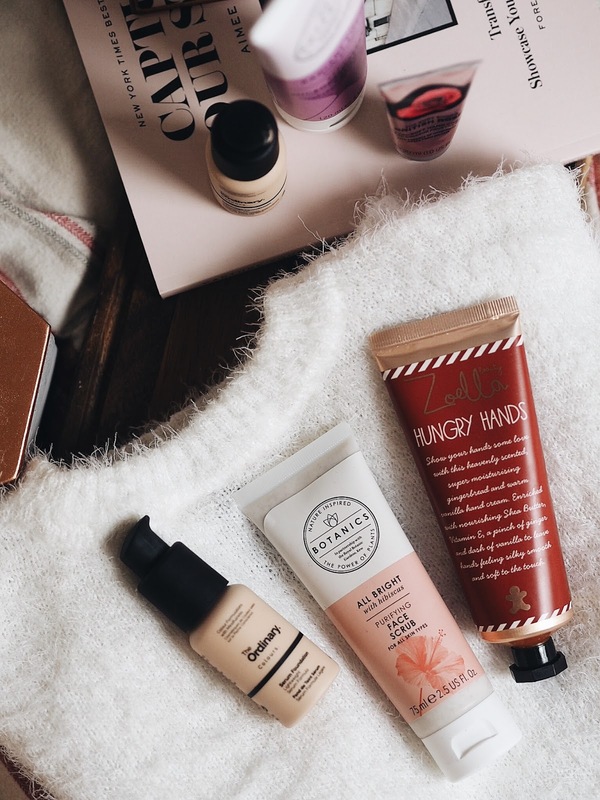 I’ve become massively obsessed with hand cream this month, and I’m not really sure why. I want to start taking better care of my hands because I like wearing pretty rings, and they don’t look so good on ugly hands. I keep a little hand sanitiser and hand cream on my desk, one in my bag for on the go and 2 on my bedside table so I can pick which scent I’d prefer. 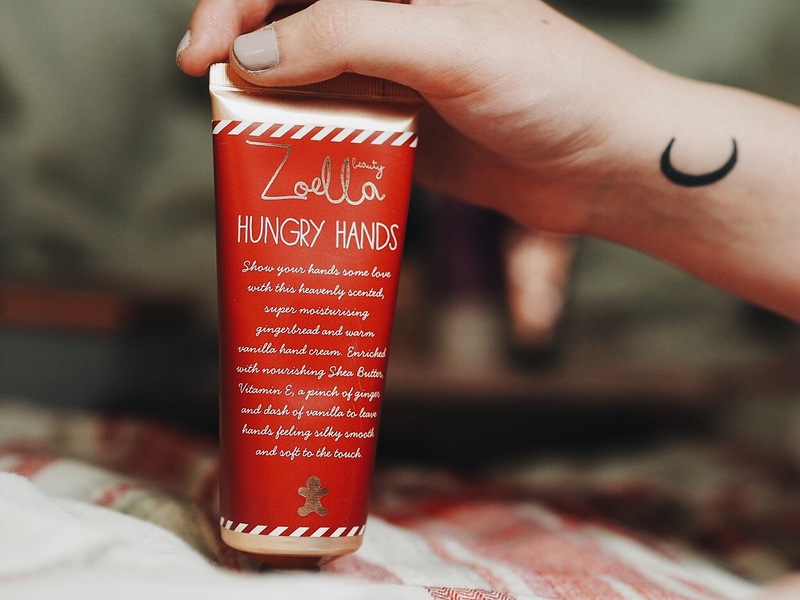 My favourite is definitely Zoella’s Hungry Hands from her collection last year; I’m completely obsessed with this scent, gingerbread, and I honestly apply it about 40 times a day. 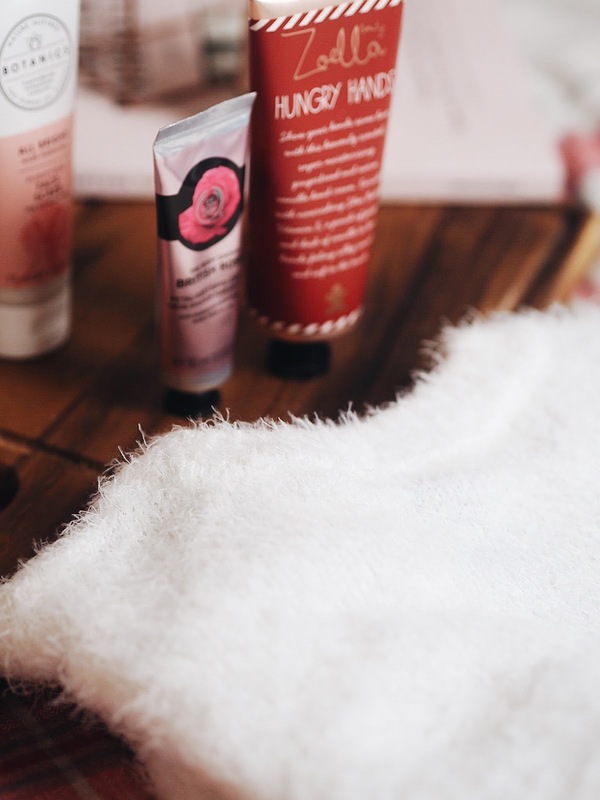 I also like to use The Body Shop’s rose scented hand cream if Hungry Hands becomes too sickly – I need to pick up some festive Body Shop hand creams, the spiced apple scent used to be my go-to and I’ve read amazing things about their vanilla pumpkin range. I have become completely and utterly obsessed with fluffy jumpers. I’m wearing one as I’m typing this. Since seeing one in an older Zoella vlog, I’ve been on the hunt and somehow ended up with 3, all £17.99 from H&M. I have white, black and burgundy, and I always reach for the white one first. They’re just so ridiculously cosy and soft, which is what you need at this time of year, and I’m definitely getting my moneys worth. I love styling them with jeans or trousers or anything really, they’re gorgeous and I cannot stop buying them. Primark also do fluffy jumpers in more of a variety of colours, but I’m not a huge fan of their v-neck style. Thanks for being the best jumper provider, H&M.